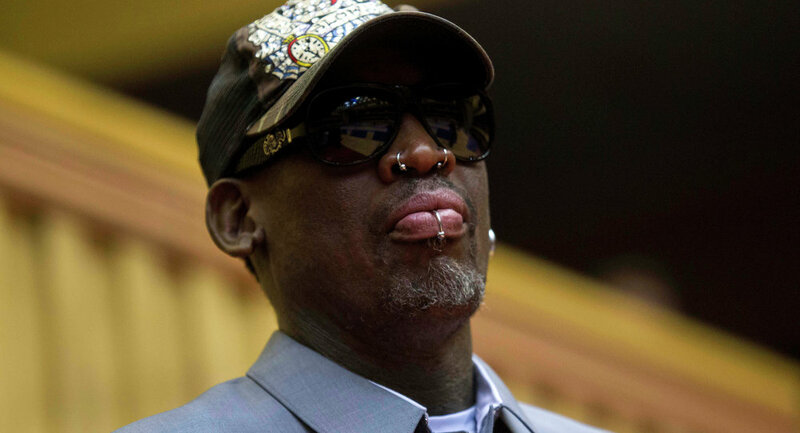 Rodman has reportedly traveled to North Korea five times so far. During his last visit in 2017, the Ex-NBA star said he was trying to reach something important for both countries. On Tuesday, famous "North Korean envoy" Dennis Rodman broke down in tears live on CNN, saying that the controversial talks between him and Kim Jong-un and between Donald Trump and Kim Jong-un were the right thing to do. "We need the doors to be open and start fresh and make this world a better place," Rodman stressed. — CNN (@CNN) 12 июня 2018 г.
Dennis Rodman, who has formed a close relationship with Kim since his visit to North Korea in 2013, said Friday in a Twitter post that he would give whatever support is needed to his friends, Trump and Kim. The former NBA defensive star expressed hope that the summit would have historic success. Rodman appeard on CNN wearing a Trump supporter "Make America Great Again" hat and a t-shirt from his cryptocurrency sponsor. In addition, Dennis Rodman recalled the sentiment and hostility he faced for meeting Kim Jong-un, saying that he even "got death threats." — Dennis Rodman (@dennisrodman) 9 июня 2018 г.
Rodman, however, said that the White House had eventually praised his efforts.